Alain Frogley is a native of Great Britain and holds degrees from Oxford University and the University of California at Berkeley. He has taught at Oxford and Lancaster universities and in 1994 was appointed to the faculty of the University of Connecticut. In spring 2008 he held an appointment as visiting professor in the Department of Music at Yale University. A specialist in the music of the late-nineteenth and twentieth centuries, particularly that of Britain and America, he has also worked extensively on Beethoven; his research has centered on sketch studies, reception history, and the cultural contexts of musical nationalism. His most recent work includes research into the reception of British music in Nazi Germany, racial Anglo-Saxonism in music, and post-colonial issues in musicology. 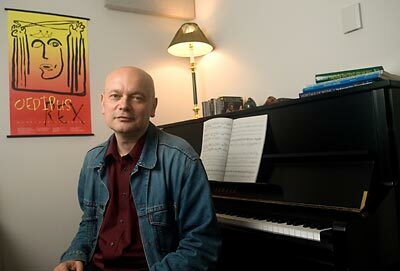 In 2005 – 2006 he was a fellow of the American Council of Learned Societies, working on a book about music and the modern city centered on Vaughan Williams’s A London Symphony. Professor Frogley’s research has been presented at international conferences and published by leading journals, including Music and Letters, Beethoven Forum, and Notes. He has edited Vaughan Williams Studies for Cambridge University Press and written a monograph on Vaughan Williams’s Ninth Symphony for Oxford University Press’s series Studies in Musical Genesis and Structure. His article “Re-writing the Renaissance: History, Imperialism, and British Music since 1840″ won the Westrup Prize for the best article published in Music and Letters during 2002 – 2003. He is a consultant to OUP on textual problems in Vaughan Williams scores. While working in Britain, he wrote and presented major BBC radio series on British and American music, and he is a regular contributor to BBC Music Magazine; in the United States he has lectured at Carnegie Hall and the Kennedy Center. Frogley is also a contributor to the revised edition of the New Grove Dictionary and to the new Oxford Dictionary of National Biography. He is active as a singer and is a member of Connecticut Choral Artists (CONCORA).